Most of the water available in summer comes from spring snowmelt. It pools on the surface of the land, soaking the tundra. The water doesn�t percolate through the soil, as it does in most places, due to permafrost, which underlies most of the area about a foot down. Although the Service has federal water rights, agency policy is to apply for state water rights through state procedures whenever possible. 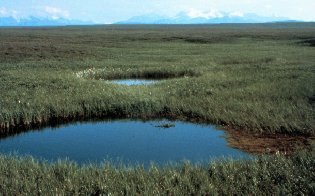 Between 1994 and 1998, the Service filed water rights applications with the State of Alaska for 140 lakes and 12 river segments on the Refuge coastal plain. Action on those applications is still pending.